Oliver Goss has won the Western Australian Amateur Championship securing a 1-up victory over Brady Watt at Mount Lawley Golf Club in Perth. Goss, who was selected for the 2012 Junior National Squad, also shared medallist honours with Watt after the pair finished at 5-under-par following the 36-hole qualification series. 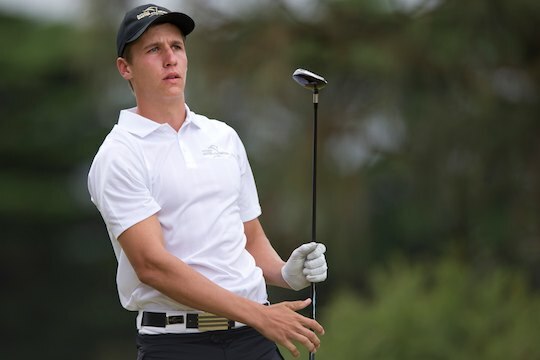 Goss has performed well this season with runner-up finishes at the Australian Amateur Medal and top-10 results at the Master of the Amateurs and the Western Australian Open. As a junior, Goss won the 2010 Graham Marsh Junior and Tamar Valley Cup. His win at the Western Australian Amateur marked Goss’ first main amateur title and the 17-year-old was more than happy with the result. “I played well last week at the Trans-Tasman and continued this week, which is good,” said Goss, who represented Australia in the series against New Zealand. Goss progressed to the championship final match with solid victories over Ryan Peake, 4&2, in the semi-finals, a 6&5 win over Ben Rodgers in the second round and a 5&3 win over Anthony Quayle in the opening round. In the final, Goss didn’t have it all his own way with Watt striking first blow to move to 2-up through three holes. By the turn, Goss had returned the match to all-square through precision iron play, yet Watt returned with a string of wins on the 22nd, 23rd and 24th to move to 3-up. It was in the closing holes where Goss rallied. The birdie putt on the 33rd hole to halve the match set the stage for his 1-up win on the 36th hole where Goss made sure his birdie putt didn’t miss for the title. “I hadn’t been dropping any putts like that all day, so it was great timing to finally get one in,” said Goss. “It was a tough pin placement, down wind and I was just happy to hit the green. Then to drop the putt was the icing on the cake”.